Traveling to the mountains of North Georgia and embarking the white waters that scour the mountains and valleys will bring about a bond with yourself: a sense of courageousness, self-worth, and sportsmanship, and a bond with your friends and family (or strangers, if you can’t fill your raft): a bond that comes from the screams, the thrills, the hard work as you plunge your oar into the water and thrust the raft through the rapids or off of rocks, the sweat of your labors, and sometimes the tears. To the thrill seekers, the lovers of nature and joy, or just the everyday reader… have we peaked your interests? Dive in. North Georgia is home to some of the best whitewater rafting in the country. A short scenic drive from Blue Ridge is the beginning of the journey. The whitewater rafting sees its best through the Ocoee River, one of the only northward-flowing rivers in the United States. Access to the river is in Northernmost Georgia and Tennessee, which is, as Blue Ridge locals refer to as “a hop, skip, and jump away.” This short drive is gorgeous and green, the experience peaking with the sunshine and fresh air flowing through your car windows. Find yourself at one of many whitewater hotspots: Rolling Thunder River Company, Ocoee Rafting Company, Carolina Ocoee, and the list goes on. Companies offer both half and full day trips, complete with the best gear, the best guides, and the best transportation. Ocoee has class III and IV rapids. The class IV rapids were the same rapids we saw in the 1996 Atlanta Olympic Games, only making the experience a little sweeter, as you can say you rafted Olympic waters. We recommend calling ahead and making reservations. It’s that busy. And it’s that fun. If you find yourself in the mountains of North Georgia, whether you’re passing through or staying a while—take the plunge. You’ll leave a little happier, a little more confident, and a little closer to nature. 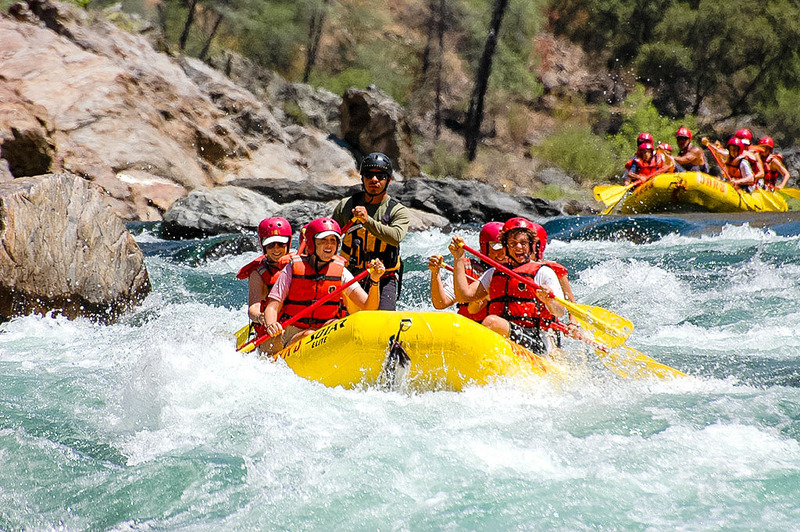 Not only is the exhilarating rafting trip a blast, you get to use your sportsmanship and comradeship and you get to spend the day with your closest friends and family. Make the trip a full day’s experience. Go to brunch. Blast some oldies on the stereo while passing through the mountains on the way there and on your way back to your cabin. Have a great dinner at one of Blue Ridge’s finest eateries, try one of Blue Ridge’s specialty cocktails or local wines, and end the night with the sun setting behind the blue silhouette mountains and the crickets chirping. The staff within each of these companies love their job. It’s a lifestyle. They love to share their passion for the river with you, to connect with them. Ask them about their stories, where they come from, what they enjoy—it might just surprise you to hear where people come to live, work, and play in our backyards.